Supporting Local Artists - Enova International, Inc.
As you may recall, Enova moved to new location last year. One of everyone’s favorite features of our space is the custom graffiti work we commissioned from local artists Miguel Aguilar and Zachary MacTavish. Being a Chicago-based tech and analytics company, we wanted to stay true to our roots and support local artists. Miguel has been working in Chicago as an artist since 1989 was a perfect fit. In addition to working as an artist, he also teaches at The School of the Art Institute. Serendipitously, Zach happened to be one of his students. The duo worked many nights and weekends to meet our move-in deadline. After each weekend, I’d visit the new space and excitedly see the progress they had made. We created a video capturing Miguel’s process that I’m excited to share with you now! 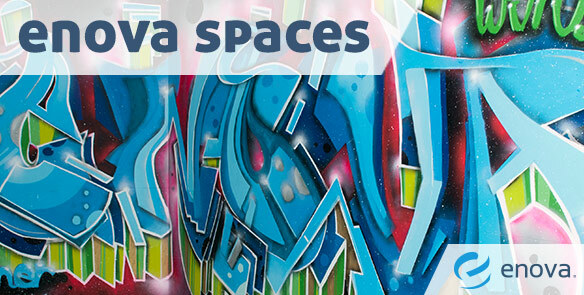 Enova Grafitti Art from Enova on Vimeo.